custom printed ribbon Archives - ThirtySevenWest ThirtySevenWest - Creative ideas about personalized custom ribbons, woven tags and labels, personalized gifts and more!!! Think about how to make the most amazing decorations, ones with warmth and a message on custom printed ribbon. Try warm metallics on cranberry red and tree green. Custom printed ribbons can take your Christmas décor up a notch. Get it personalized with heartfelt messages and or a company logo, and you have got a Christmas or other holiday theme unlike any other! Let’s see if these few décor ideas using customized ribbon can make your Christmas merrier! Put aside the wreaths and the Christmas lights; it’s time for your custom printed ribbons to take their place on your mantels and window frames. A stunning textured matte holiday-themed personalized ribbon with metallic gold or silver will work perfectly. The traditional satin is always just beautiful with a luxury quality double face satin ribbon so both sides gleam and reflect Christmas lights and candle glow. Take a substantial length of ribbon and shape it into a Christmas garland, you can tie up the ribbon neatly into festive knots at intervals, and attach them securely using nails. Make sure to allow your ribbon to drape down a little between each nailed knot (about an inch below the hanging knot-tails). 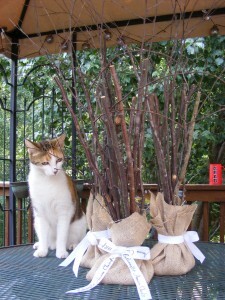 You can do this with one-colored ribbon, or combine two or more for a charming touch. Why leave the chairs looking drab and empty for a Christmas party, when everything else is decked out in greens and reds, or blue and gold, or green and gold, or pink and silver? Whatever is your holiday color selection for this season. Choose your ribbon according to the color theme, have it printed in complementing lettering, and just twist and twirl it around the chairs! You can be as creative as you like; tie up your customized ribbon into bows and knots, or use it as it is along the surfaces. Batteries are included?, Deck the Halls, Just for you, Happy Hanukkah, Spin the Dreidle, Miracle of 8 nights, Festival of Lights, Happy New Year, Let it Snow!, Reindeer Land Here, to adorn the place settings and cutlery can incorporate the spirit of holiday in each aspect of a holiday party. 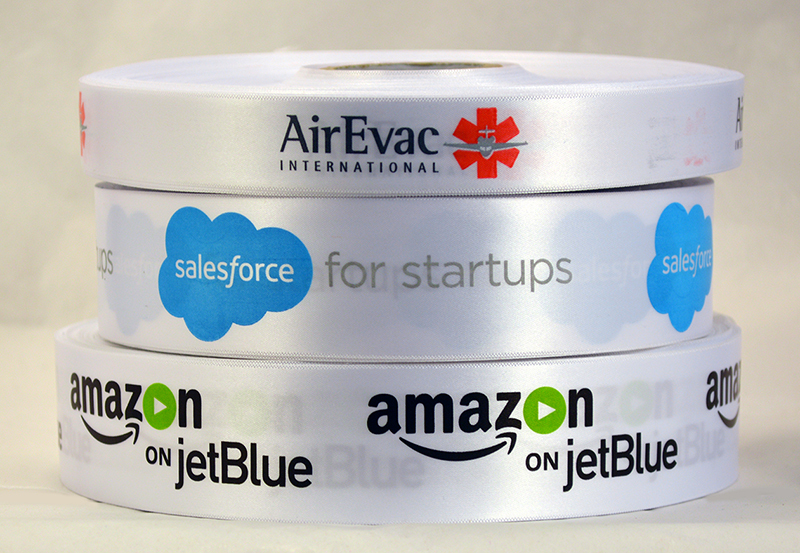 Christmas Hanukkah Tree for Amazon on Jet Blue with Custom Printed Ribbon with ornament for the employees! A more special touch-up to the conventional elementary school paper chains, festive ribbon chains using customized ribbon can really bring some merriment. Cut approximately 1 ½ inch-wide ribbon into 6 inch lengths. Loop the first piece to make a circle and secure it with a double-sided tape. Take another piece to loop it through the first circle, and tape it too. Repeat till you have the desired length of chain, and hang it up wherever you want! Just imagine! A DIY party to make ribbon chains using messages on ribbons cut in to chain link lengths. Put all your favorite one message on your chain or choose a selection of your favorite ones to create a really unique holiday reminder message ribbon for this year. Start a collection and have a new one year after year after year. Have an annual party like a tea party! Start a tradition this year! Batteries are included?, Deck the Halls, Just for you, Happy Hanukkah, Spin the Dreidle, Miracle of 8 nights, Festival of Lights are some suggestions. Use those same ribbons and join a couple together to make an ornament hanger rather than using metal hooks! Deck out your Christmas tree…with ribbon! For a truly decadent affect, weave your ribbon in and out of through the branches. Make sure to loop your ribbon between the branches, tying a knot where needed, so that the twines stay put. A beautiful idea would be to match your ribbon’s color to your overall Christmas décor. Tip: For an exceptionally pretty look, use a giant bow to create an intricate tree topper. 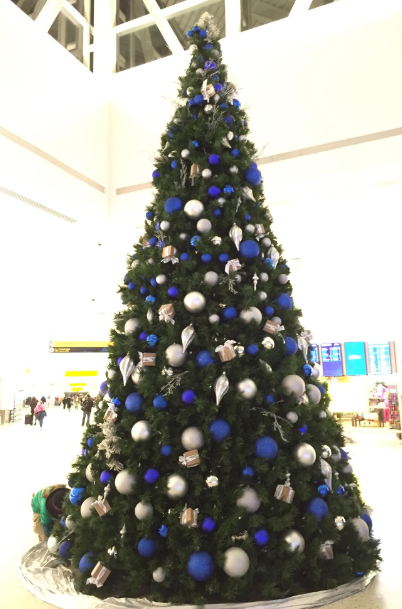 Your tree is all wrapped up and looks amazing! Need more ideas for customized ribbon décor? 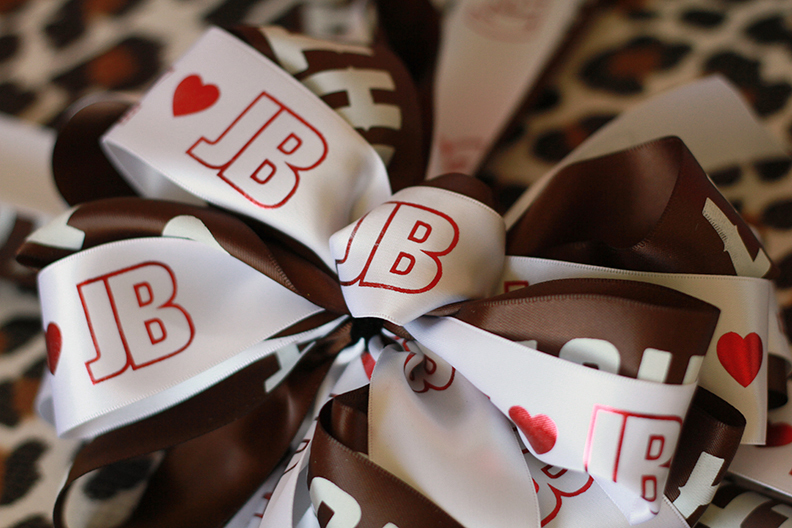 We provide personalized ribbons for every occasion! Whether it is a corporate or casual holiday gift you need to wrap, we will help you design a great ribbon for you! It’s that time of the year again, as hopeful students walk across a stage, receiving their diplomas and looking towards a brighter future. Whether they are finishing high school, or entering the “real world” after college, most young adults will always remember their graduation. 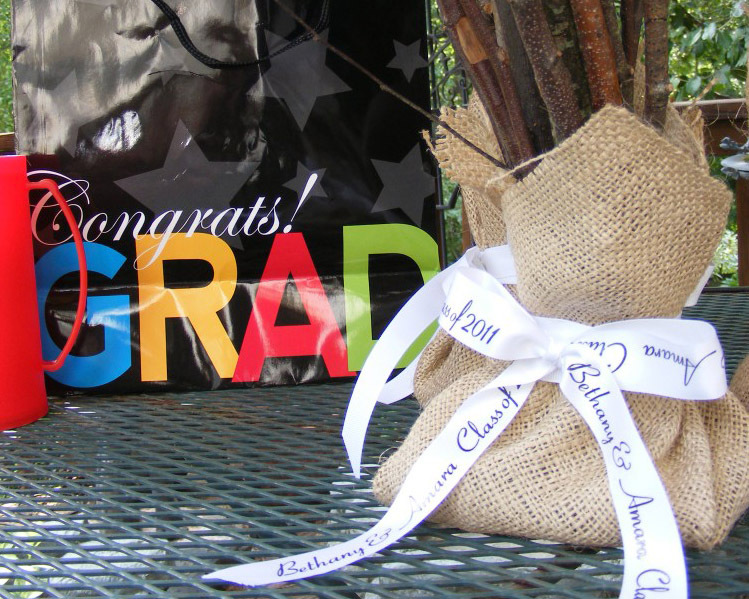 Personalized ribbon can be a small, but important accent to any good graduation party, there are so many uses for it! Custom ribbon is a great way to make gifts special and help set a festive mood for the entire party. We all feel special when we see our name imprinted on something. Everyone at the party can take a piece of the ribbon for a keepsake. You might even ask your school to give permission to use the school logo on the ribbon!